These are currently my working notes and resource links on the various technologies surrounding the internet of things wireless technologies..
Smart phones and tablets don’t have support for Ethernet. and use Wi-Fi as the main connection technology and mobile technologies ( 3G and 4G) when they’re not in the range of a WiFi connection. The IOT will consist of an array of new devices that are very different to tablets and PCs. The main characteristics of these devices are likely to be. They will be low powered – battery or solar. They will have limited processing power and memory. Operate over a wide variety of ranges. Although existing wireless technologies (Wi-Fi, Bluetooth, 3G/4G) will be used to connect these devices, other newer wireless technology, especially designed for IOT applications, will also need to be considered, and will likely grow in importance. When talking about Wireless connectivity and technologies I find it useful to place the technologies into categories based on. Because existing technologies (Wi-Fi and Bluetooth) weren’t originally considered suitable for IOT applications a number of new wireless technologies have been developed. However both Wi-fi and Bluetooth have been updated or are being updated for use in IOT applications. Wi-Fi – low powered Wi-Fi has been developed, but apparently it is not backwards compatible with existing WiFi networks this is likely to limit its use in IOT applications. Bluetooth– Bluetooth is generally regarded as a PAN (Personal Area Network) and is mainly used for connecting peripherals. See beginner guide to bluetooth. However Bluetooth has undergone major changes with BLE (Bluetooth low energy) also known as Bluetooth smart. Bluetooth low energy has been developed for IOT applications, and is already in widespread use. Because Bluetooth is in such widespread use it is likely to be a major technology for IOT applications. In addition Bluetooth is likely to support IPv6 addresses which will make every Bluetooth device addressable from the Internet. Here is RFC7668 for IPv6 over Bluetooth. Here is good article covering Bluetooth as well as other LAN wireless technologies. 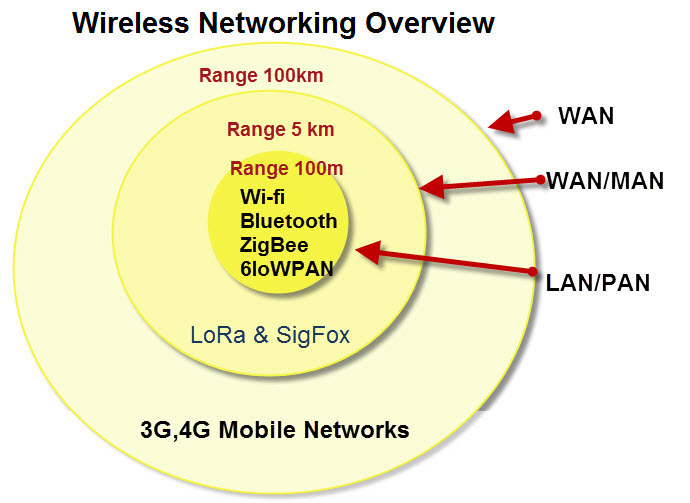 ZigBee– It is based on the IEEE 802.15.4 standard and supports IPv6. Thread– A device to device D2D technology designed specifically for connecting home appliances. It is based on the IEEE 802.15.4 standard and supports IPv6 addressing. There has been no need for wireless technologies in this range as it was catered for by mobile networks (2G,3G and 4G). SigFox- SigFox originated in France and is not an open standard. It is marketed as a service to existing mobile carriers who need to provide connectivity to IOT devices. According to this Link labs article it is mainly suitable for alarm type data. According to the same article is also seems to be having problems adapting the technology for the USA market. LoRa- Managed by the LoRa alliance it is an open protocol and is marketed in a similar manner to SigFox i.e to mobile carrier networks. Links Labs are part of the Lora alliance and provide more details in these articles here and here. My Opinion/Note – I will be interesting to see if these new wireless technologies will survive in this space . They could well be replaced by cellular solutions (LTE-M) and Long range Bluetooth or Wi-Fi. Existing 3G and 4G networks will be used but there are a number of low powered alternatives that are being developed by he mobile carrier networks. See this overview for more details and a comparison. There are certain considerations that must be taken into account when assessing a wireless technology for a given application. Ease of deployment. – Example LTE-M uses the same base station equipment as LTE and requires only a software upgrade to deploy. Whether or not a technology is IP capable is an important thing to bear in mind. This is likely to be a major consideration for the long-term viability of a technology. Bluetooth for example isn’t currently IP6 capable but will be. Here is the RFC.